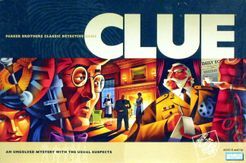 Buy Clue and PriceWatch, Buy this board game at the Lowest Price. This game is unlike any other. All of the characters are fictitious even the "victim" is imagined. It is like a stage play. The scene opens in Mr. Boddy's palatial mansion. Mr. Boddy is the victim of foul play and is found in one of the rooms. Each player takes the colored token nearest to him on the board, and uses it throughout the game. The player having the red token, Miss Scarlet, rolls the die and moves first. After Miss Scarlet has moved, the next player on the left rolls the die and moves. Each of the other players follows in turn. In succeeding games players should take turns, dealing and starting. Players to reach a room may move their tokens on the yellow squares anywhere on the board according to the throw of the die. All the yellow squares on the board are for the movement of tokens. Tokens can move forward, backwards, or crosswise, but never diagonally. A token may be moved forward and crosswise on the same turn, but it cannot move to a particular space twice in the same turn. No two tokens may occupy any one square, nor may a player move his token through a square occupied by another token. A room, however, may be occupied by any number of tokens and weapons. Whenever a player moves into a room he should make a "Suggestion". A "Suggestion" consists of naming a Suspect, a Weapon and the Room into which the player has moved. As soon as a player makes a suggeston the token of the suspect named and the weapon named are brought into the room named in the suggestion. No player may forfeit a turn to remain in a particular room. Players must move by a throw of the dice or by the secret passages on each turn. When a Suggestion has been made the first player to the left of the one making the Suggestion examines his cards to see if he is able to prove the Suggestion false. To disprove the Suggestion he must hold one or more of the cards named. (In our example above, the cards named are Mr. Green, the Wrench and the Lounge). If he holds one or more of these cards, he must show one only to the player making the Suggestion. This must be done without the other players seeing the card shown. (If Miss Scarlet holds in her own hand one or more of these cards, perhaps the Lounge and Mr. Green, she may soon discover whether some other player has the Wrench, or if it is hidden in the envelope. A smart player will often deliberately make a Suggestion naming one or two cards that he holds in his own hand just to gain information or to mislead the other players). When a player is satisfied that he knows the three cards hidden in the envelope, he can on his turn, make an Accusation. He states that he is making an Accusation and names the three cards he believes to be in the envelope. Then, carefully, so that the other players do not see, he looks at the three cards in the envelope. Contrary to the rules for making a suggestion a player may make an accusation whether or not his piece is in the room he mentions. If the Accusation is correct, that is, if the player finds in the envelope, those 3 cards that he just named, he lays the cards face up on the table, and he is the winner. If the Accusation is incorrect, the player returns the three cards to the envelope unseen by any other player and replaces it on the board. Having made a false Accusation he has no further moves in the game, and cannot win, but remains as a player to contradict Suggestions made by other players with the cards he holds in his hand. However, if the player's token is resting on the space before a doorway, he would move this token into the room so that it would not block the door. From there it would be available for other players to move into other rooms in order to make Suggestions.